DD Form 2792-1, Special Education/Early Intervention Summary is a United States Military form used to enroll in EFMP and to record special educational needs of a dependent child from birth through the age of 21 whose health condition requires special educational services. The latest revision of the DD 2792-1 was last issued by the Department of Defense (DoD) in August 2014. An up-to-date fillable version of the form is available for download below or can be found on the DoD Documentation website. What Is DD Form 2792-1? The DD Form 2792-1 is used to compile the information required to help the military assignment personnel match the child's special needs to the available educational service-related resources at a particular duty station. The Special Education/Early Intervention Summary is a part of a package of forms necessary for enrolling in the Exceptional Family Member Program - or EFMP for short - and for the Family Member Travel Screening Process along with the DD Form 2792, Family Member Medical Summary. Despite being issued by the Department of Defense, DD 2792 and DD 2792-1 are required for EFMP enrollment for individuals serving in the Army, Navy, Marine Corps and Air Force. AUTHORITY: 10 U.S.C. 136; 20 U.S.C. 927; DoDI 1315.19: DoDI 1342.12; and E.O. 9397 (as amended). PRINCIPAL PURPOSE(S): Information will be used by DoD personnel to evaluate and document the special education needs of family members. Education Activity files. The SORNs may be found at http://dpclo.defense.gov/Privacy/SORNsIndex/DODComponentNotices.aspx. member with special educational/early intervention needs. Items 1 - 7. Completed by sponsor or spouse. evaluation for the family member. - Change in EFMP Status. Items 2.a. - h. Child/Student Information. Self-explanatory. sponsor, spouse, or legal guardian. Self-explanatory. Items 3.a. - h. Sponsor Information. Self-explanatory. Items 4.a. - d. Self-explanatory. personnel at the public school the child attends or would attend. students are not required to complete the DD 2792-1.
services provided and indicate total time services are provided. responsible for screening or enrollment in the MTF. of information if it does not display a currently valid OMB control number. PLEASE DO NOT RETURN YOUR FORM TO THE ABOVE ORGANIZATION. 4.a. ARE BOTH SPOUSES ON ACTIVE DUTY? b. Does this child receive early intervention services under a current Individualized Family Service Plan (IFSP)? b. Is this student currently being evaluated for special education services? If Yes, what disability category? c. If your school determined the student eligible for special education services within the past 3 years, did the parent decline special education services? a. Child exhibits high risk or dangerous behavior. The EFMP is a program run by the U.S. Department of Defense. The program was designed to provide support and services to United States military family members with special needs including spouses, children, and dependent adults. Service members may enroll in the EFMP if they have a family member or family members with a diagnosed physical, developmental, intellectual, emotional or psychological condition that requires specialized medical attention or educational services. Individuals need a completed the DD 2792 and DD 2792-1 forms to enroll in the program. The forms should be completed by a spouse, primary care provider, or sponsor. Participation in the EFMP and access to the wide range of medical, educational, and family support functions it provides is available for servicemen of every military branch. The completed forms are submitted to an Army Medical Treatment Facility (MTF) with all necessary attachments. The EFMP Case Coordinator reviews the provided data and forwards the forms to the appropriate Regional Health Command (RHC) who will then determine eligibility. If the application is approved, the RHC downloads the data into the EFMP database on the Army Personnel Network and the Case Coordinator informs the Soldier of the success of the application. The first page of the form provides step-by-step instructions on how to correctly file the DD Form 2792-1. The Special Education/Early Intervention Summary is completed by the parents or sponsors of the dependent and by school personnel or early intervention staff. Items 1 through 7 are to be filled by a spouse or a sponsor and provide the type of request and all of the necessary personal information on both the enrolled family member and the sponsor or spouse, along with the current military status, phone number and email address. Provide details about DEERS enrollment, the other spouse's military status, elementary or secondary education eligibility and intervention service participation in Boxes H and I of Item 3 and Items 4, 5 and 6. The person filling the form should date the form and certify it with their signature. The rest of the form should be completed by an EIS provider or school representatives. 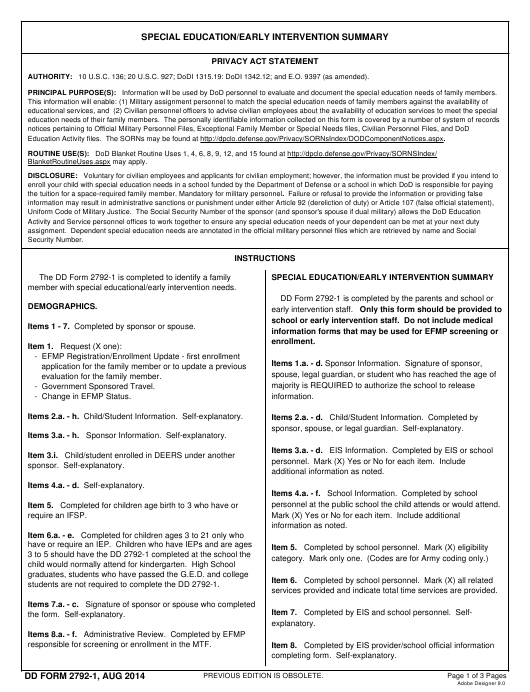 DA Form 7246, EFMP Screening Questionnaire. AF Form 2523, Exceptional Family Member Program-Medical Information Form (EFMP-M). AF Form 4380, Air Force Special Needs Screener. NAVPERS Form 130016, Report of Suitability for Overseas Assignment.